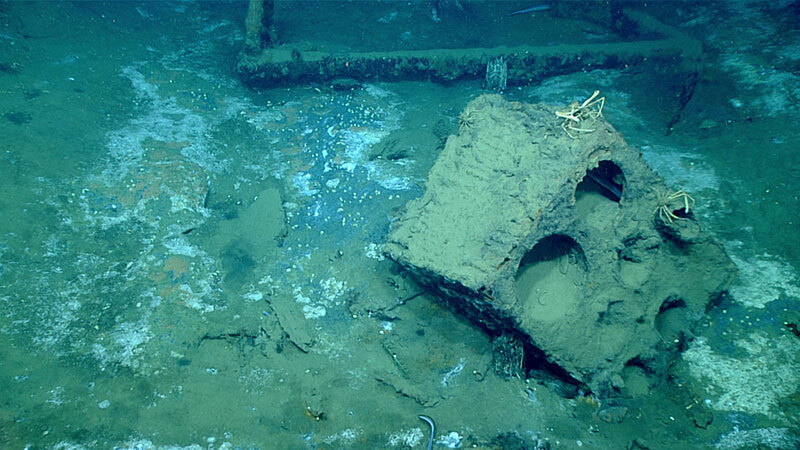 First view of the wreck’s bow outlined by the remnant copper sheathing, with one hawse pipe in foreground and another just aft of the stempost at right. Also visible are white colonies of the stony coral Lophelia pertusa (on the stempost and at far left) and numerous duckbill eels. Image courtesy of the NOAA Office of Ocean Exploration and Research, Gulf of Mexico 2017. Download larger version (jpg, 832 KB). Transferware teacup and open end of a glass bottle found toward the stern. Image courtesy of the NOAA Office of Ocean Exploration and Research, Gulf of Mexico 2017. Download larger version (jpg, 1.0 MB). Ship’s stove, found amidships, is a likely home for two spider crabs, Rochinia crassa. Image courtesy of the NOAA Office of Ocean Exploration and Research, Gulf of Mexico 2017. Download larger version (jpg, 1.0 MB). During Dive 07, the team explored a shipwreck known only as 'Wreck 15377,' which was first identified from an oil and gas industry survey back in 2002, but never visually surveyed – until now. Video courtesy of the NOAA Office of Ocean Exploration and Research, Gulf of Mexico 2017. Download larger version (mp4, 40.1 MB). Dive 07 took place at an unknown shipwreck first identified during an oil and gas industry survey in 2002 and classified by the Bureau of Ocean Energy Management as “ID Number 15377.” During the dive, we conducted a full survey of the wreck, collected imagery to generate a 3D mosaic survey, and documented biology living on the wreck. 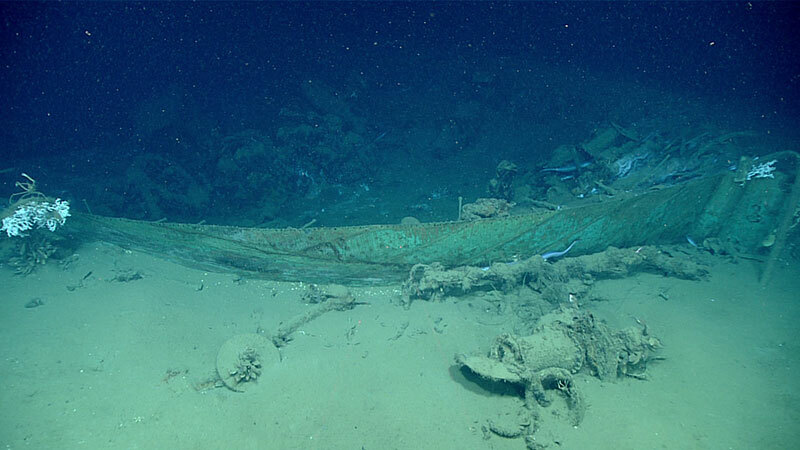 Deep Discoverer approached the shipwreck from the bow, revealing a wooden hull clad in copper sheets. Lead draft marks tacked to the wreck’s stem post suggest that a large portion of the hull remains buried in the sediment. On the starboard side of the vessel, we documented a large sheet anchor stowed on deck amidships, remnants of a suction bilge pump with cast-iron flywheels, and a ship’s cast-iron stove. 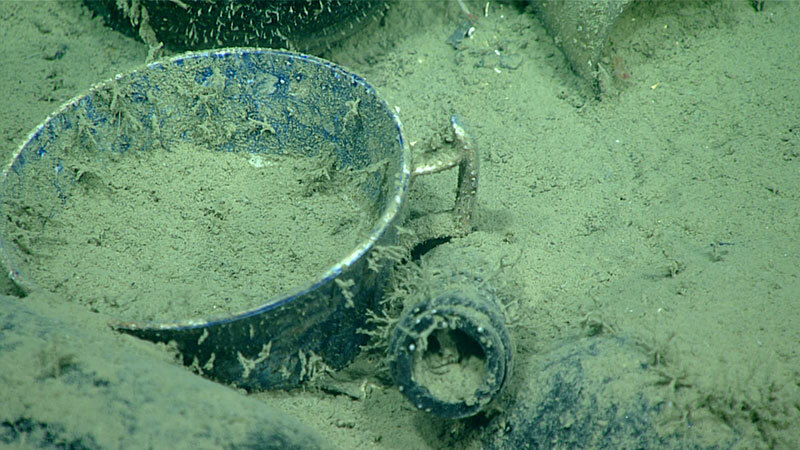 Artifacts observed in and around the wreck included a variety of bottles, a basin and pitcher, glassware, and ceramic storage jugs. Based on initial analysis, archaeologists believe the ship likely post-dates 1830 to perhaps mid-century and was likely a merchant vessel, built for distance and capacity over speed. The biology inhabiting the wreck was exciting, including hundreds of “duckbill” Nettastomatidae eels, many spiny crabs (Rochinia crassa), and Chaunax fish. There were also remnants of naval shipworm (possibly Teredo) calcareous burrows in the wooden ribs, likely responsible for the breakdown of much of the structure prior to sinking. Many thick bacterial mats and occasional Lamellibrachia tubeworms indicated the presence of a chemosynthesis-based ecosystem, likely from the degradation of the wood structure.